BAM Jam, presented by Treasure Valley Ford Stores, typically features some of the most talented men's and women's players in the northwest. Thanks to a centralized location with college programs of all sizes located near by, it is no shock that players ranging from community college to the professional level play in the tournament. There are far too many players to list all of them with details so we've picked out a few highlights and have listed them here. 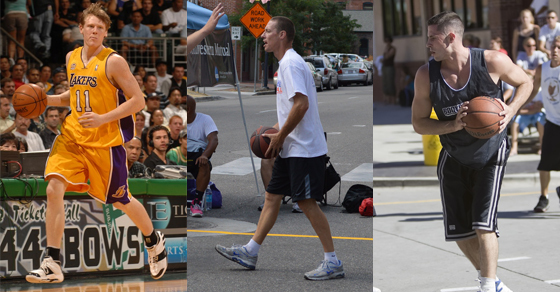 Coby Karl – Karl is currently listed on the Walking Buckets (6'0 Over Elite) roster along side former Boise State Broncos Rob Heyer and Mark Sanchez and Boise State Assistant Coach John Rillie (who played at Gonzaga and is an Australian native). Karl would be the first NBA player to participate in BAM Jam. Karl played for the Los Angeles Lakers during the 2007-08 season and also with the Cleveland Cavaliers in 2009. This past season he played with the Reno Bighorns in the NBA D-League. With Karl, Rillie and Sanchez the Walking Buckets will have 3 professionals on their squad, the most of any team this tournament. Matt Bauscher – The “do everything” former Boise State Bronco is rumored to be considering a come back at BAM Jam with Team Muscle Pharm in the Men's 6'0 Over Elite. Bauscher retired from professional basketball this past year after a very successful run in Europe. The Muscle Pharm team lost a key player about 2 weeks ago in Booker Nabors, who blew out his Achilles while competing at the USA Basketball 3 on 3 National Tournament in Colorado Springs. Bauscher would make a nice fill in and will definitely make Muscle Pharm a top contender. The returning 3 players with Muscle Pharm, Chris Allen, Kevin Baker and Craig McGee, were all on last spring and summer's championship team and also did very well at the USA Basketball 3 on 3 National Tournament this past July. Will Bogan – Bogan was an all state player and state champion at Vallivue High School in Caldwell, Idaho before signing to play with Ole Miss. After graduating in just 3 seasons with the Rebels, Bogan transferred to Valparaiso where he started 62 of 68 games. He is playing for Unlimited Range in the 6'0 Under Elite division.